Our video above is a brief view of the annual Nidderdale Show 2018 in Pateley Bridge. We saw Julian Norton from the Channel 5 TV series of the “The Yorkshire Vet” signing his book “The Diary of a Yorkshire Vet”. 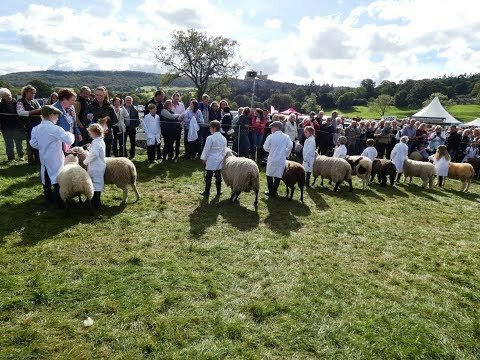 The Nidderdale Show held annually in the picturesque surrounds of Bewerley Park Show Field in Pateley Bridge is a traditional Yorkshire Dales agricultural show, where visitors can browse a wonderful display of the finest live stock, produce and crafts that the Dales have to offer. The show traditionally marks the end of the agricultural season and attracts crowds of up to 17,000. It is a classic and timeless event and includes many events such as sheep dog trials, a dog show, show jumping, live stock classes, cookery demonstrations, trade stands and an exhibition cricket match. Food and drink are available around the show ground and there is also a fun fair. The Nidderdale show is truly a fantastic day out for all the family of all ages. Pateley Bridge is in Nidderdale near Harrogate in the Yorkshire Dales of North Yorkshire. From York head towards Ripon and then take the B6265 into Pateley Bridge OR head towards Knaresborough and then take the B6165 into Pateley Bridge. The Show Ground is on the left just over the bridge. There is a designated free car park for the show with a tractor and trailer shuttle service. Parking: please follow the signs for the free car parking. The show ground has plenty of public toilets and places to eat and drink etc. There are two more public toilet blocks in the town and for refreshments there are shops, pubs, cafes and a fish and chip shop.